Norma Jean (Leedy) Engelberth, formerly of Pierceton, Indiana and most recently of Grace Village Retirement Community of Winona Lake, passed away at 12:50 p.m. on Wednesday, September 5, 2018 at Kingston Care Center of Fort Wayne, Indiana at the age of 86. She was born on September 13, 1931 in Kosciusko County, Indiana to Amsa Leedy and Mary Maria (McDonald) Leedy. On January 25, 1953 she was married to Ernest “Ernie” A. Engelberth. The shared 65 years of marriage together before he passed away on May 3, 2018. She attended Winona Lake Grace Brethren Church in Winona Lake, Indiana, longtime member of the Gideons International, and a former member of Monroe Hilltoppers Home Ec Club, and she especially loved being a homemaker for her family. Norma was a good wife, always helping her husband, Ernie, sharing their life as well as work on their family’s dairy farm and farming the majority of their lives in the Kosciusko County area. Norma formerly worked as a bank teller for Indiana Lakes Federal Credit Union in Warsaw. 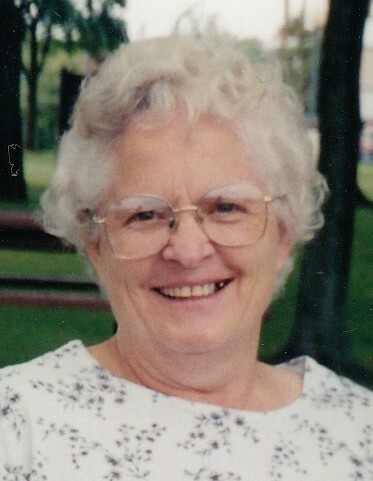 She loved music, musical concerts, and enjoyed watching her grandchildren. Most of all she loved her family and will be dearly missed. She will be lovingly remembered by her three daughters: Susan (husband Mike) Heintz (Sidney, Ohio); Connie (husband Mike) Lehe (Wolcott, Indiana); Karen Engelberth (significant other Sean Barrows) (Parker, Colorado); three sons: Lloyd (wife Nora) Engelberth (Greenwood, Wisconsin); Doug (wife Ann) Engelberth (Fort Wayne, Indiana); and Tom (wife Ramona) Engelberth (Edgerton, Ohio). Also surviving are fifteen grandchildren and fifteen great-grandchildren. She was preceded in death by her parents, husband, three brothers, and three sisters. Visitation will be held on Saturday, September 8, 2018 from 9:00 – 11:00 a.m. at Redpath-Fruth Funeral Home, 225 Argonne Road, Warsaw, Indiana. Her funeral service will follow at 11:00 a.m. and officiated by Tom Miller. Burial will take place at Oakwood Cemetery of Warsaw. Memorial donations in Norma’s name may be directed to Winona Lake Grace Brethren Church, 1200 Kings Highway, Winona Lake, Indiana 46590; or to Grace Village Retirement Community - Caring Friends Endowment, 337 Grace Village Drive, Winona Lake, Indiana 46590 and would be appreciated by the family.